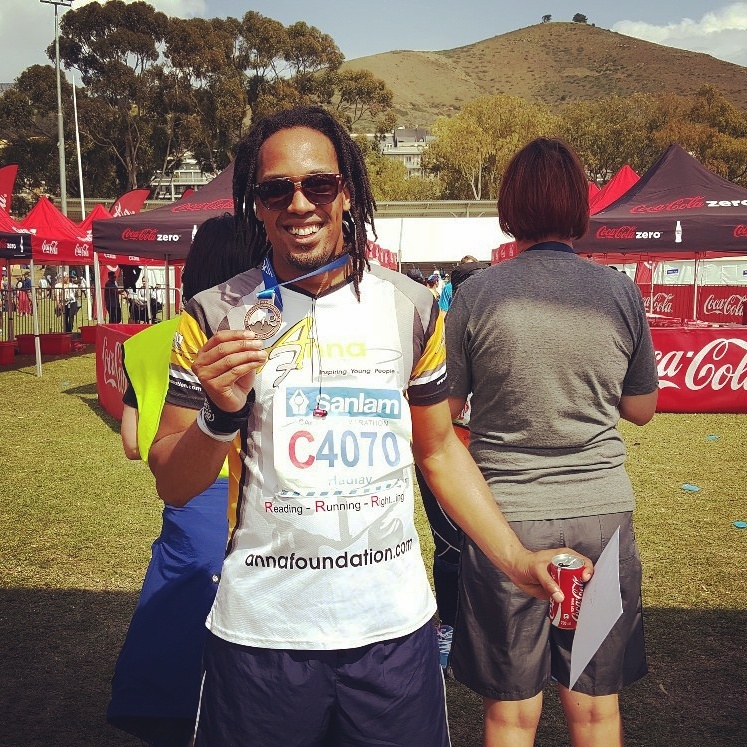 It’s been three weeks since I ran the Cape Town Marathon. I feel a little bad for taking so long to write this blog post about the experience. But to be honest, after all the pressure and stress leading up to the event I really just wanted a break from “marathon talk”. I knew going into this that it would be mentally draining but nothing could have prepared me for the mental and emotional roller coaster that lied ahead of me. The two weeks leading up to race day were filled with daily battles of the mind, will and emotions. One moment I felt super confident after a good training session then the next moment I’d be filled with panic thinking to myself “What the hell are you doing Hadlay!? !.” But I pushed through it. The main motivation behind sticking to my guns and completing the challenge (besides my ego of course) was the fact that I was doing it all for the Anna Foundation. My training sessions, especially the long runs on the weekend really challenged me and helped me deal with my own insecurities. When you’ve been running for an hour or two in the opposite direction of your car you really don’t have a choice but keep going until you finally make your back to the parking lot again. My training and the marathon itself reinforced my belief that I can do anything I put my mind to. But the biggest change came indirectly through the Anna Foundation and the kids that they support. I felt that giving up on this challenge would equate to giving up on the little ones who rely on the resources that the Anna Foundation provides. How could I be that selfish? I had no choice, I had to see the challenge through to the end. I was filled with so much joy when I learnt that the Anna Foundation raised a whopping R82 000 through the fund raising effort of all the marathon runners. That is AMAZING and I’m sure that the money will be put to great use. There were 17 runners in total who participated in the challenge of which 12 were first time marathon runners. Which stands to prove that we certainly can do whatever we set our minds to. Now that the marathon has come and gone I’ve been asking myself what’s next? How do I possibly challenge myself beyond running a freaking marathon? I still don’t have the answer to those questions but there’s no rush or pressure to figure it out just yet. For now I’m just content catching up and reconnecting with friends who I haven’t seen since I started training. I can redirect my focus to all the wonderful people in my life and my career. Whatever it is that lies ahead, I know I’ll be welcoming it with open arms and a happy heart. I can’t end this blog post without thanking everyone who has supported me throughout my training. I appreciate the kind words and the faith you have in. To the people who contributed financially to the success of the campaign THANK YOU! We would not have reached such an amazing target without your help. Think about it, R82 000! You’re a part of that. Kate Kuilman, Deon Malan, Rory Fell, David Robertson, Alice Santos, Chantelle Bowyer and Shamima Khan, you’re the BEST!